The documents, on sale for around $2,000, would help an asylum claim in Europe. The forger who sold us the papers, said that they are being used by ISIS fanatics to travel undetected across borders into Europe hidden among tens of thousands of genuine refugees fleeing the terror and destruction. Once in Europe they can set up sleeper cells or live freely under a new identity without facing the consequences of their brutal past actions. The revelation comes as Lebanon warned two in every 100 Syrian migrants smuggled into Europe are ISIS-trained fanatics, with most travelling overland through Turkey to Greece. The extremist group is sending trained jihadists ‘under cover’ to attack targets in the west, Lebanese Education Minister Elias Bousaab told British Prime Minister David Cameron during his visit to the country on Monday. 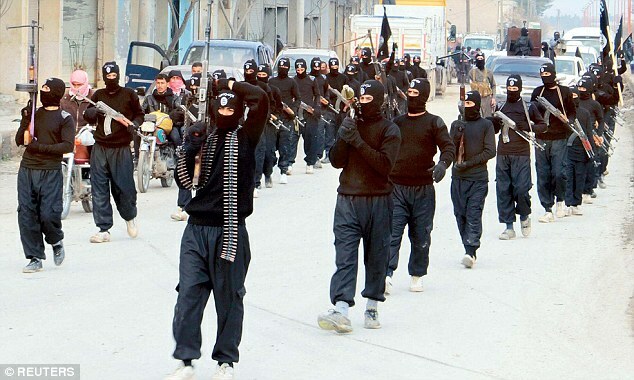 ‘ISIS will not stop at the border with Lebanon, before you know it ISIS will be in Europe,’ Mr Bousaab claimed. The bogus papers are also being used by economic migrants from other Middle Eastern states who know that a Syrian asylum claim will be met with more sympathy following the civil war which has so far forced an estimated four million people to flee. The recent death of Aylan Kurdi, the three-year-old boy pictured after he was washed up on a Turkish shore, has heightened demands for countries to take in Syrian refugees and propelled their plight to the top of the international agenda. 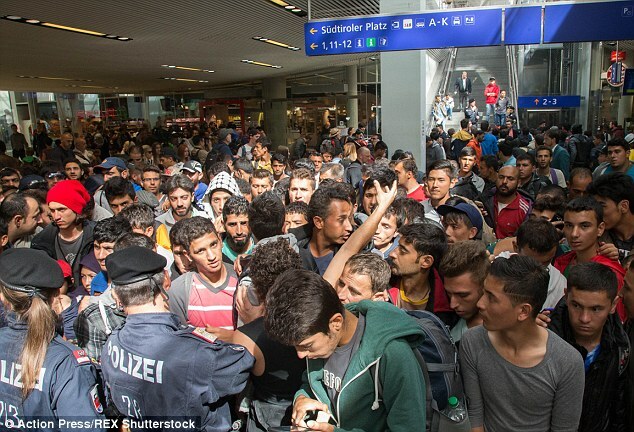 Germany alone is expected to take in a million Syrians this year and is putting other European nations under pressure to sign up to a quota system. The passport book MailOnline acquired is genuine, made from a batch seized from one of the many Syrian government offices captured by advancing opposition forces. The forger explained that the militias fighting the forces of Assad make a beeline for government offices when they over-run a town. They know the value of the documents there and steal the passports, papers and even the printers that are used to create identity cards and driving licences. ‘I don’t know which town this passport came from because it has happened many times,’ he said. ‘Fighters – from the Free Syrian Army, Al Nusra, ISIS or whatever – they know the value of these documents. They take them and they give them to us. They ask us to make new identities for them and their families so they can travel outside Syria. 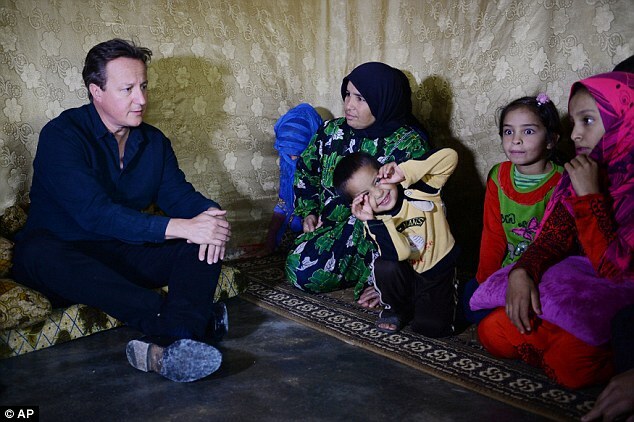 He went on: ‘Everyone wants to be Syrian now – because now everyone welcomes Syrians. There are Palestinians, Egyptians, Iraqis, people from all over the Arab world who are pretending to be Syrian so they can have a new life in Europe. Alarm bells began to ring as to the scale of the problem earlier this month when German customs officers seized packages containing a large number of blank Syrian passports. The packages contained both genuine and fake passport books. Frontex, the EU border agency, has reported an increase in the seizure of Syrian passports for sale although they admit they as yet have no idea of the size of the problem. ‘The latest figures confirm that document fraud is on the rise,’ a spokesman told MailOnline. 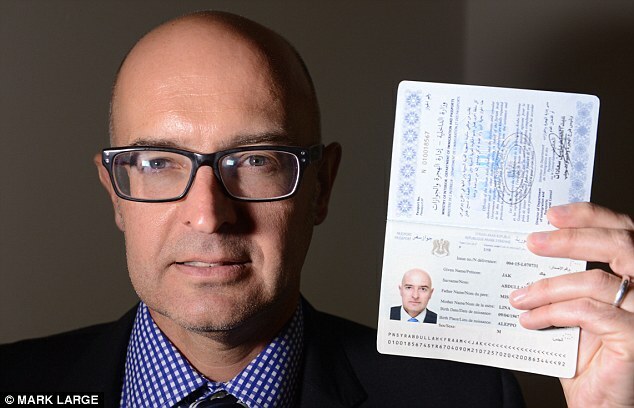 ‘Imposters use another person’s documents taking advantage of their physical resemblance to the original holders, as often difficult to identify. ‘Research studies show that the extent of the problem is much wider than can be assessed from the number of revealed cases. The blue passport book is printed with the words Syrian Arab Republic in Arabic, English and French on the cover. It bears a Syrian coat of arms – an eagle holding a shield of the national flag and a scroll with an inscription in Arabic. The 48-page booklet has a bar code and serial number. 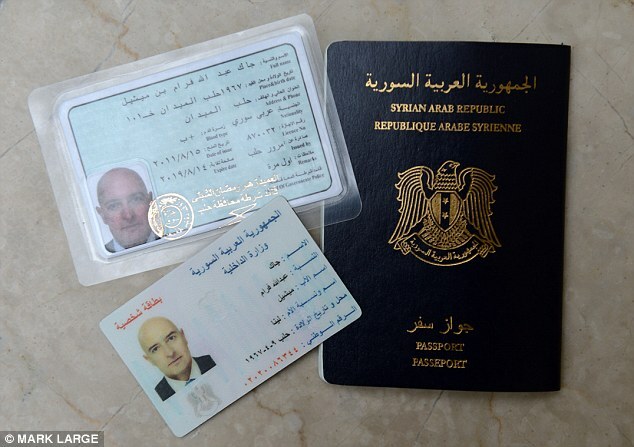 The passport states in Arabic, English and French that the photograph is the image of a 48-year-old Christian man called Jak Abdullah Fraam who was born in 1967 in Aleppo. It states that his father is called Mishail and his mother Lena. The document gives the holder permission, from the Syrian government, to travel to countries in the Middle East, Europe, North America, African and South America. However Syrians need visas to enter almost every country apart from Sudan and Lebanon. Other Syrian passports have restrictions on which country the bearer can travel to. The identity card bears the official government seal and is printed using machinery captured by opposition forces and handed over to master forgers. The Syrian coast of arms is embossed into the card. An image of the Syrian coat of arms sits underneath the photograph. There is a watermark-style image on the right-hand corner and on the back of the ID card. The international driving licence was issued by the Traffic Police Department of the Syrian Ministry of Interior. It bears the official stamp of the Chief of Governorate Police. These three documents together provide almost irrefutable evidence of a life in Syria before the war and would support a claim for asylum in Europe. 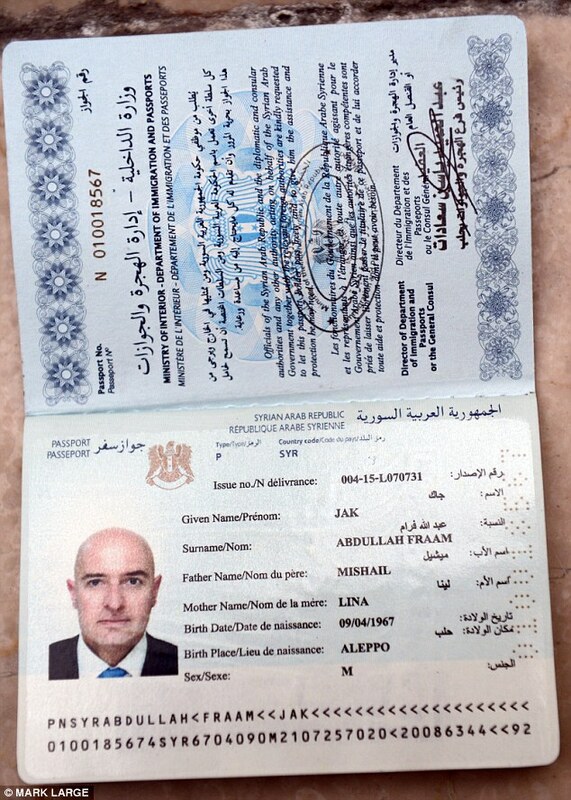 The manufacture of passports and identity documents by forgers began innocently following the collapse of Assad’s Syrian regime, when many citizens lost their official papers in the chaos and society broke down. But this ‘public service’ has been hijacked by unscrupulous criminals who will sell anyone the documents to claim they are Syrian. ‘At first it was a way to keep normal life going,’ a Syrian with knowledge of the practice of creating new passports told MailOnline. ‘When someone got married they needed a certificate. When a baby was born they needed a certificate. When someone wanted to go abroad they needed a passport. But in much of the country there was no government. ‘However, the people who had worked for the government, local people in each town or city liberated from the regime, were still there. Former Scotland Yard detective, and passport and identity fraud expert, Tom Craig, told MailOnline that the passport and other documents would be enough to get someone into the EU. ‘While there are some discrepancies the passport is good enough to get someone into Greece or Italy. It took just four days for MailOnline investigators to buy the haul in Turkey. Publishing precise details of the operation would put the lives of Syrian and Turkish investigators in danger, but in essence it was surprisingly easy. 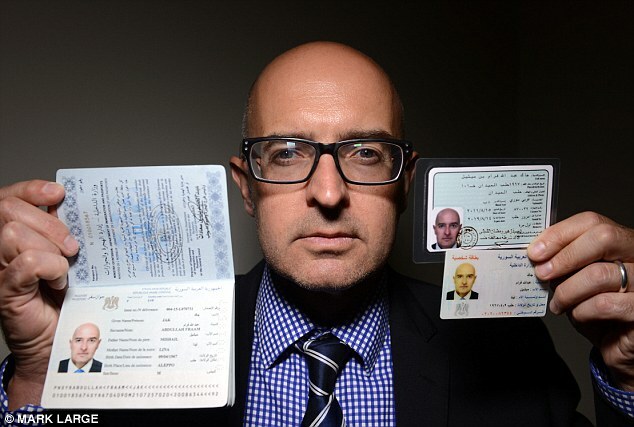 The reporter sent a photograph via social media to the forger in Syria, who made the documents and then smuggled the documents over the porous border and dropped off for collection. Keith Vaz, the chairman of the Home Affairs committee told MailOnline the revelations were ‘deeply disturbing’. Philip Hollobone, Conservative MP for Kettering, said the MailOnline investigation had brought a serious security to light. He said: ‘I would like to congratulate MailOnline for your work in exposing this very serious security issue. ‘There is little doubt that evil jihadists will be keen to exploit the present refugee crisis to infiltrate their way into Europe and the UK. In the present chaos fake passports provide almost perfect cover. Philip Davies, Conservative MP for Shipley, said: ‘This is a very worrying development and highlights why we need to properly control our borders and not get so get so overwhelmed by a compassionate desire to help people that we let down our guard. MailOnline has contacted the Turkish authorities to inform them of the scam.